PITTSBURGH, Sept. 20, 2016 - Wombat Security Technologies (Wombat), the leading provider of cyber security awareness and training, today announces Dynamic Reporting capabilities to provide security administrators the enhanced ability to discover and visualize trends and patterns in security awareness data. 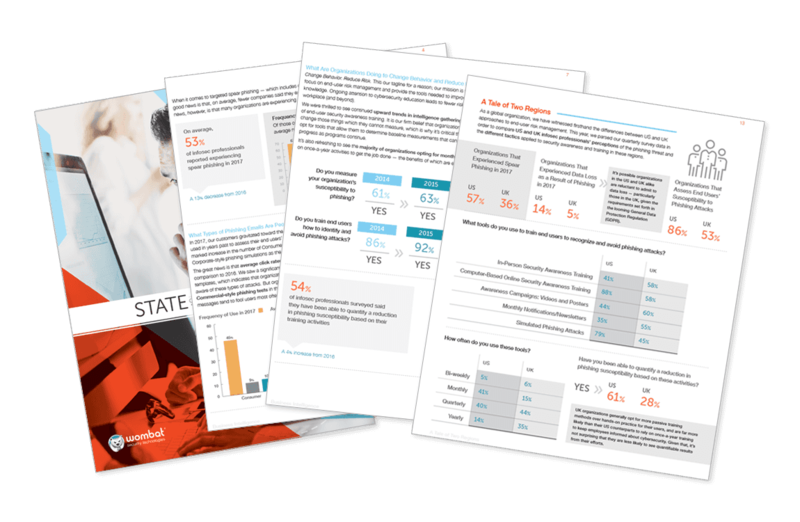 Through a new Leaderboard report, Wombat offers organizations a detailed view into user performance and the ability to deploy gamification of security education programs to further motivate employee engagement in training initiatives. Dynamic Reporting allows customers to refine the reports and zoom in on specific areas of interest, such as time frames, specific security topics, groups, or individuals. The Leaderboard report builds on these enhancements, empowering customers to create, save and share refined dashboard-like views of their users’ training module performance in real time or over time. It ranks users with a formula that uses time to complete an assignment and module scores across any combination of training modules. When end users see their department or location is ahead or behind compared to others, it encourages training completion. Administrators can use individual scores or group scores to increase attention and drive training penetration across the organization. Training Assignment Comparison - Shows completion rates and other statistics. Administrators can filter the report to view multiple assignments by date, completion status, and/or users participating in the assignment. Training Assignment User Details - Provides comprehensive user-level information for training assignments. Administrators can drill down to the user level and module level and view a number of data points, including a user’s module score percentage, time to complete the module, and total questions answered. There is also a chart view that shows the overall user progress against any assignments showing in the data set. Training Module Completion Summary - Tracks all end-user interactions with the training modules. Administrators can filter by module, date range, assignments, and a myriad of other criteria to find data on user participation in any Wombat module. Most Missed Training Topics - Alerts admins to the topic areas users are having the most trouble with in Wombat training modules. By highlighting weaknesses, admins can more effectively focus your training efforts. The report can be filtered by module, date, and/or assignment. Training Module Performance - Shows the average score for each module, as well as the module score for each user. A chart view highlights the top 25 user scores. The report can be filtered by training module, date, and/or assignment that allows administrators to find exactly the data necessary to make an action plan for users. Company Policy Acknowledgement - Offers a detailed view of learners who have responded to a policy acknowledgement statement that was added to a training module through our Training Jacket feature. Administrators can filter by module, date range, assignment name, and policy acknowledgement response. Two chart views show the status of policy acknowledgment responses. Additional customization features including the ability to add or remove fields, and export to CSV and Word to provide the executive level a comprehensive view of results from the security education program. Customers who adhere to strict Data Privacy can obfuscate individual end user scores while still benefiting from aggregated data views.